http://newiprogressive.com/images/stories/S5/scottwalker-dream-279h.jpg New Marquette Poll shows support for Gov. Scott Walker is still floundering locally since his failed out of state adventure last fall for the Republican Presidential nomination. Other issues on guns, local schools, the Wisconsin economy and water quality remain important to voters. MILWAUKEE – A new Marquette University Law School Poll released Thursday shows statewide approval of how Wisconsin Gov. Scott Walker is handling his job stands at 38 percent with 57 percent disapproving. In November, 38 percent approved and 58 percent disapproved. Thirty-six percent say they would like Walker to seek a third term as governor, while 61 percent would not like to see him run. In September 2015, 35 percent supported a bid for a third term while 62 percent did not. 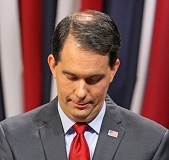 Walker's approval rating has remained low ever since he returned to Wisconsin from his failed bid last fall for the Republican Presidential nomination. While his followers in the state legislature have continued to push his pro-capitalist anti-worker agenda in Madison, he has failed to regain the leadership of the party he enjoyed before leaving the state to campaign. In related state issues, guns and gun laws continue to be an issue for Wisconsin residents. In 2012, three Marquette Law School Polls asked whether respondents favored or opposed “legalizing possession of concealed weapons” while such legislation was under debate. Between 46 and 47 percent supported legalizing concealed carry, while between 49 and 51 percent opposed the proposal. Concealed-carry legislation was passed and became law in 2012. In the current poll, respondents were asked if they favor or oppose the “current law allowing residents to obtain a license to carry concealed handguns.” Sixty-three percent favor the current concealed-carry law, while 31 percent oppose it. Respondents were also asked about a proposal to allow concealed-carry permit holders to have a gun on school grounds and for local school boards to have the option of allowing permit holders to enter schools with concealed weapons. On this issue, 31 percent favor the proposal while 65 percent are opposed. Background checks for private gun sales and sales at gun shows have also been a recent issue in state. Eighty-five percent of registered voters favor background checks for private and gun show sales, while 12 percent oppose them. When last asked in May 2013, 71 percent favored and 26 percent opposed such checks. Registered voters continue to express concern for education funding in the state. Fifty-seven percent say their local public schools are receiving too little funding from the state, while 30 percent say they receive enough and 7 percent say schools receive more funding than they need. Asked how they would react “if your local school board proposed a referendum to increase taxes for schools,” 55 percent say they would be inclined to vote for the referendum while 35 percent say they would be inclined to vote against. Voters have become somewhat more negative in their views of the economy since April 2015. Twenty-six percent say the economy has gotten better over the past year while 31 percent say it has gotten worse. In April 2015, opinion was reversed, with 31 percent saying the economy had improved over the past year while 26 percent said it had gotten worse. As for the outlook for the coming year, 27 percent expect the economy to improve while 25 percent say it will get worse. Last April, 31 percent looked for improvement with 18 percent expecting a downturn. Nine percent of respondents say they have heard reports of contamination of drinking water in their county in the past two years, while 86 percent have not heard of any such reports. Statewide, 27 percent have heard that the City of Waukesha is currently unable to meet state and federal standards for the amount of radium in its drinking water, while 72 percent have not heard. The City of Waukesha has submitted a proposal to divert water from Lake Michigan for its water supply and return an equal or greater amount of treated waste water to the lake. Thirty-four percent of respondents state-wide favor this proposal while 51 percent say the city should find other solutions. The Marquette Law School Poll is the most extensive statewide polling project in Wisconsin history. This poll interviewed 806 registered Wisconsin voters, by both landline and cell phone, January 21-24, 2016. The margin of error is +/- 4.0 percentage points for the full sample. For Republican presidential primary voters, the sample size is 313, with a margin of error of +/-6.5 percentage points. For Democratic presidential primary voters, the sample size is 312, with a margin of error of +/-6.5 percentage points. The partisan makeup of this sample, including those who lean to a party, is 42 percent Republican, 47 percent Democratic and 10 percent independent. The long-term estimate over the previous 31 statewide Marquette polls, with 26,727 respondents, is 42 percent Republican and 47 percent Democratic, with 9 percent independent. The partisan makeup excluding those who lean to a party is 25 percent Republican, 32 percent Democratic and 40 percent independent, compared to the long-term estimate of 27 percent Republican, 31 percent Democratic and 38 percent independent.